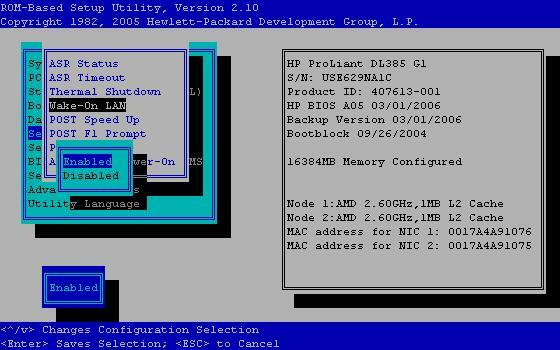 BASIC-Like power control programming and scripting language. Customize your power controller using simple, powerful BASIC scripting. 2. Next, set up network adapter options to enable WOL. In Windows, you'll log on as an administrator, launch Device Manager, select the network adapter used for WOL, open the properties and click "advanced". Check the list of options displayed. Again, they will vary from computer to computer. Look for an option like "WOL", "Magic packet" or "enable remote power control" and enable it.. Here's a good description of WOL setup under Linux. While you're setting this, make note of the MAC address of the physical WOL port. Here's a utility to help find the MAC address if it isn't apparent..
On most systems, only one physical Ethernet port on the motherboard can be used for WOL. 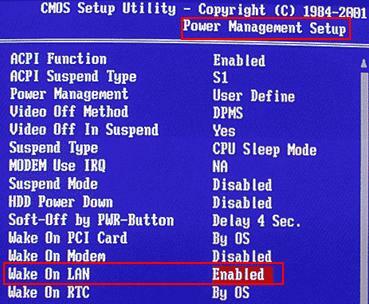 Once WOL is enabled in the BIOS, you'll see a link light only on this port when system power is turned off. If WOL doesn't power-up the machine, first check that broadcast is passing through your router or switch. 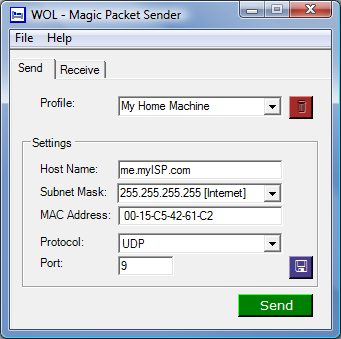 The WOL "magic packet" needs to be broadcast to all systems via the OSI Layer 2 broadcast address. WOL is most commonly configured to function only between devices in the same subnet. Troubleshoot using a direct connection via a crossover cable. The Wikipedia WOL explanation is helpful. 4. Now you're ready to create a script. It's easy. Log in as admin. Follow the scripting link on the left. Disable scripting. Enter the following example as shown below. Subsitute your MAC address in string 2 in the format 01:02:03:04:05:06 Enable scripting. Cycle power to the switch. Line 1 of the script sends a magic packet to the target MAC in string 2 and wakes the target. 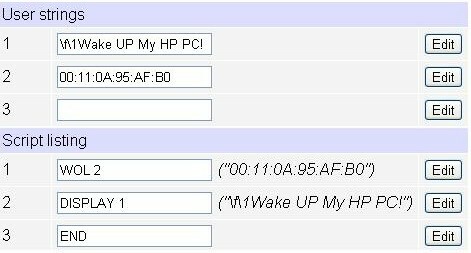 Line 2 of the script just prints a message "Wake up..." to the LCD. In this example, we've used "power up" to start the script. This works because Line 1 is always executed on power-up when scripting is enabled. You can start scripts with an HTTP command, shortcut on the desktop, autoping event, remote program, or a more complicated script. Have a look at the scripting page for more examples. Hope this helps. Please share comments and suggestions. Thanks!